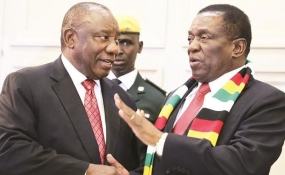 President Cyril Ramaphosa has reiterated South Africa's commitment to work with Zimbabwe in addressing the socio-economic challenges experienced by the two neighbouring countries. "Although our BNC is only just over three years old, our relations date several decades. Through steadfast servicing of this BNC, our two countries will be able to consolidate the bilateral cooperation existing between our countries and to explore other areas of cooperation," the President said. "In support of your commendable efforts, in February of this year at the World Economic Forum, South Africa made a call to the international community to assist Zimbabwe and lift sanctions. We are pleased that the European Union heeded the call and in February 2019 decided to lift sanctions on the current members of your administration," he said. President Ramaphosa said this is the first of many steps needed to support Zimbabwe's recovery. "South Africa stands ready to render support to Zimbabwe within our means in your quest for economic renewal. It is our wish that, using the BNC mechanism, we should at our level strive to provide the strategic impetus to drive the bilateral relations to a significantly higher level." "I am encouraged by the participation of South African business in various sectors of the Zimbabwean economy such as engineering, construction, banking, retail, hospitality, mining exploration and services, among others. There are undoubtedly good prospects for both of our countries, but there is a need to ensure ease of doing business and elimination of trade barriers," President Ramaphosa said.